Who knew? Who knew that a life of sleeping all day, staying up all night, feasting on bugs, and fluttering and swooping and soaring in the night sky could be boring? I know, I know, it’s crazy! One might think, “That’s the life for me, I tell ya!” But, I guess, night after night, the sameness might get a bit tiresome. So when a window is left open, this group of bats seizes the opportunity to do something different. They’re going to the library. The older bats have been here before and head off to their favorite bookshelves. The young ones, however, haven’t yet discovered the magic inside libraries. They play with the overhead projector, splash in the water fountain, make photocopies of themselves, and play house in the pop-up books before finally settling down to story time. Then the magic happens. Everyone is captured by a book, swallowed by a story. 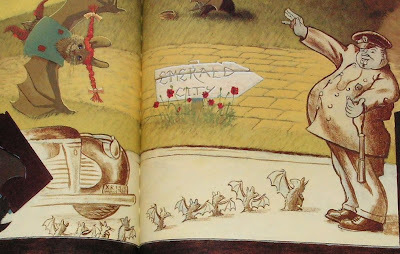 The bats take over the illustrations of famous children’s books. There’s a midnight ride and a flying bed. There’s a sword and a stone and a hobbit hole. There’s a bat with red pigtails and one with a red riding hood. There’s plenty more, but my favorite illustration resembles this much loved classic. As can so easily happen, time slips away. The sky lightens, and the library’s late-night patrons must take off. Back through the window they go, hoping that sometime soon, a generous librarian will once again leave a window open. 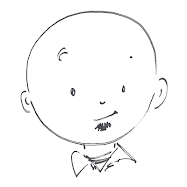 Look closely at Brian Lies’ illustrations. Are the bats upside down or is it the background? And why are those books flipped? 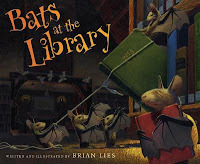 Little details are everywhere, starting with the spectacles on an elder bat to the iPod earbuds used to lasso a book in the cover illustration, and there’s more to discover with each reading of Bats at the Library.